The Mission Local, an enewspaper from San Fransisco published an article about local Lutherans take on the ELCA policy. The article features several ELM roster members- Rev. Jeff Johnson, Rev. Susan Strouse and Rev. Dawn Roginski and mentions ELM’s candidacy process. 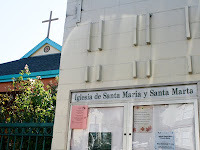 St. Mary’s and St. Martha’s is one of the four churches that is issuing a call to Rev. Megan Rohrer (ELM roster) for her street ministry. Read the full article here. This entry was posted on Thursday, September 17th, 2009 at 11:37 am	and is filed under Blog. You can follow any responses to this entry through the RSS 2.0 feed. Both comments and pings are currently closed.